Sunny October weather on a great walk to High Pike and Carrock Fell. Holiday Cottages in Mosedale... What a place to live being so close to the open fellside. Mosedale and the slopes of Bowscale Fell. 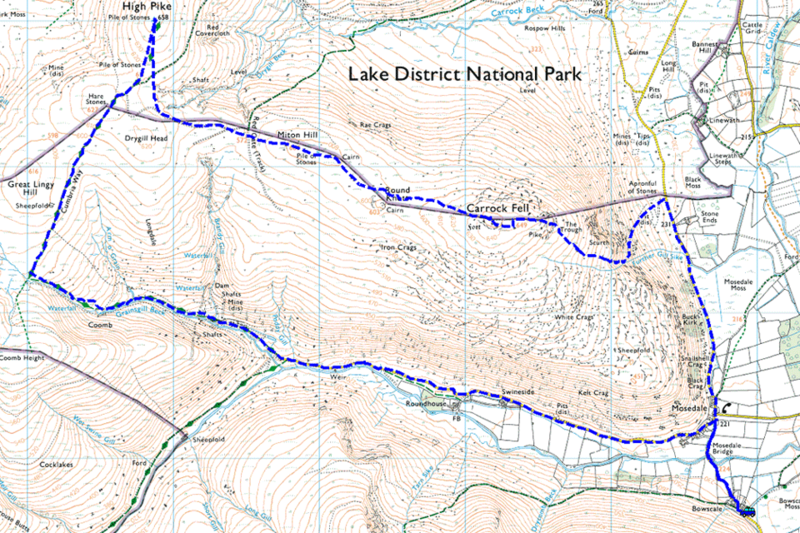 The diagonal path across the fell ascends to Bowscale Tarn. A Buzzard gliding on the thermals high above. Coomb Height at the end of Mosedale. Skiddaw Little Man just under 8km away (5 miles). Lingy Hut at the top of Longdale. Ruined mines in Longdale alongside Grainsgill Beck. And a view down Mosedale from the top of Longdale as I join the Cumbria Way and turn north. Carrock Fell over to the east. High Pike summit shelter and Trig Col.
Carrock Fell (the next peak of the day) from High Pike. Cross Fell and the Pennines. Carrock Fell from Miton Hill. Carrock Fell summit cairn - just a couple of metres higher than High Pike. Ancient Remains (now changed into a shelter) in the centre of the Iron Age fort atop of Carrock Fell. Open views across the Eden Valley from the descent down to the road. Streaks of cloud over Lakeland.